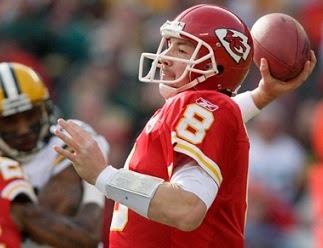 The Green Bay Packers were sporting a 13-0 record as they faced the Kansas City Chiefs on December 18, 2011. While they were the defending champions as well as being undefeated thus far, Head Coach Mike McCarthy’s team was not particularly impressive on defense. LB Clay Matthews and 35-year-old CB Charles Woodson were stellar performers, but the Packers tended to give up passing yards at a prodigious rate. However, the high-scoring offense more than made up for it. QB Aaron Rodgers was an excellent passer who rarely made mistakes and had a fine group of receivers. However, they had just lost their top receiver, WR Greg Jennings, plus their leading rusher, RB James Starks, due to injuries. Kansas City, meanwhile, had just fired Head CoachTodd Haley the previous Monday. Defensive coordinator Romeo Crennel was the interim coach of a team that had lost many key players to injuries early in the season, including QB Matt Cassel, RB Jamaal Charles, TE Tony Moeaki, and SS Eric Berry. QB Tyler Palko failed as the replacement for Cassel and sixth-year veteran Kyle Orton (pictured above), who had begun the season with Denver, was taking over the starting duties. There were 74,093 fans in attendance at Arrowhead Stadium. The Chiefs had first possession and drove 79 yards in 14 plays. QB Kyle Orton completed four passes, two of which converted third downs, but after being stopped at the Green Bay one yard line, they ended up with a 19-yard field goal by Ryan Succop. The Packers were on the verge of going three-and-out on their first possession, but punter Tim Masthay was roughed and the series continued. They reached the KC 41, from where Mason Crosby missed on a 59-yard field goal attempt, but got a second shot from 54 yards when the Chiefs were penalized for too many players on the field. Like the first kick, the second sailed wide to the right. Kansas City responded with a nine-play, 42-yard drive. Orton hit on three pass attempts and Succup came through with another field goal, this time from 32 yards. The first quarter ended with the Chiefs ahead by 6-0. The Packers had the ball as the game entered the second quarter and had to punt after reaching midfield. Starting at their 15, the Chiefs again drove into Green Bay territory. Orton continued to complete short to medium passes, a total of six along the way, and running backs Thomas Jones and Jackie Battle (pictured at left) pounded away with short gains. A nine-yard carry by Jones reached the Green Bay three, but the Packers stopped Kansas City’s attempts to score on the ground, including a fourth-and-one run by Battle, and the Chiefs came up empty. The teams traded punts for the remainder of the period, with neither able to mount any threats. After a half of play, Green Bay had gained just five first downs and Aaron Rodgers was successful on only 6 of 17 passes for 59 yards. The teams exchanged punts to start the third quarter before the Packers, taking over at their 46, went 54 yards in six plays. The big one was a Rodgers completion to TE Jermichael Finley that gained 41 yards to the KC seven. Three plays later, Rodgers threw to WR Donald Driver for a two-yard touchdown and, with Crosby’s extra point, Green Bay was ahead by 7-6. The Chiefs responded with a scoring drive of their own, advancing 69 yards in seven plays. Orton went deep right away and connected with TE Leonard Pope for 39 yards to midfield. Another pass, to WR Jonathan Baldwin, picked up 17 yards and, after a third-and-14 throw to FB Le’Ron McClain gained nine yards, Succup kicked a 46-yard field goal to put the home team back on top by 9-7. As the period came to a close, Green Bay was driving. Rodgers scrambled for 19 yards and completed two passes to get to the Kansas City 39. However, the Packers, passing up a long field goal attempt, came up empty when a fourth-and-eight pass fell incomplete. Orton threw to WR Steve Breaston for 16 yards, McClain ran for nine, and then a pass to Pope picked up 33 yards to the Green Bay three. However, the Packers held on defense and Kansas City settled for another Succup field goal, this time from 20 yards. Still, it gave the Chiefs a five-point lead with 11:28 to play. The Packers had to punt following their next series and the Chiefs drove 66 yards in eight plays. Breaston started things off with a 25-yard run on an end-around. Orton completed passes of 13 yards to WR Dwayne Bowe and 16 yards to TE Anthony Becht to reach the Green Bay five. Battle finished off the series with a one-yard touchdown carry and, with Succup adding the extra point, Kansas City’s lead was up to 19-7. Green Bay got the ball back with less than five minutes left on the clock. Rodgers completed five passes, with the biggest gainers to WR Randall Cobb for 16 yards, Nelson for 22 yards in a second-and-20 situation, and 31 yards to Finley to get to the KC 15. The nine-play, 85-yard series ended with Rodgers running for the last eight yards and a TD. Crosby added the PAT, but the Chiefs still led by five with just over two minutes now remaining. The Packers attempted an onside kick that went out of bounds and that was it as Kansas City was able to run out the clock. 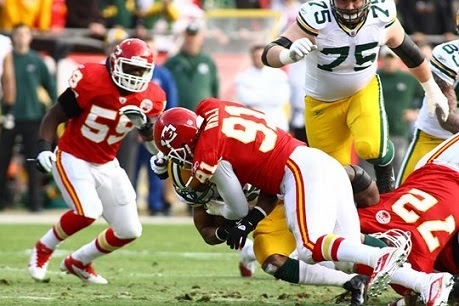 The Chiefs handed Green Bay its first defeat of the season by a score of 19-14. Kansas City dominated time of possession (36:11 to 23:49) and led in total yards (438 to 315) and first downs (23 to 16). There were no turnovers, but the Chiefs recorded the only four sacks of the game. The point total was Green Bay’s lowest of the year. Kyle Orton completed 23 of 31 passes for 299 yards with no touchdowns but also no interceptions. Thomas Jones led the ground attack with 48 yards on 15 carries and Jackie Battle had 37 yards on 10 attempts that included a TD. Steve Breaston caught four passes for 50 yards and, in addition, had a 25 yard run. Dwayne Bowe was right behind with 49 yards on his four pass receptions and Le’Ron McClain also caught four, for 26 yards, to go alone with his four rushing attempts for 20 yards. LB Tamba Hali (pictured below) accounted for three of the team’s sacks on defense. For the Packers, Aaron Rodgers ended up with 17 completions in 35 attempts for 235 yards and a TD and had another 32 yards on three runs that included a score. Ryan Grant ran for 66 yards on 12 carries and added another 35 yards on three pass receptions. Randall Cobb had four catches for 53 yards and Jermichael Finley gained 83 yards on his three receptions. Kansas City split the last two games of the season to finish at 7-9 and last in the mediocre AFC West (the other three teams were all 8-8). It was enough to make Romeo Crennel the head coach for 2012, but with disappointing results as the club dropped to 2-14. As for the Packers, they won their last two games to end up atop the NFC Nortth with a league-best 15-1 record, but were upended in the Divisional playoff round by the Giants.